Join the Richmond Beach Running Club on Tuesday night, July 24, 2018 for the first Pub2Pub Run of the year - a run from Salish Sea Brewing Co. in Edmonds to the Ridgecrest Pub in Shoreline. L on 175th; R on 5th; L on 165th to Ridgecrest - finish! 6.5 miles total. While there will be a water stop along the route, you may want to run with some extra water with you - it's going to be sizzling! 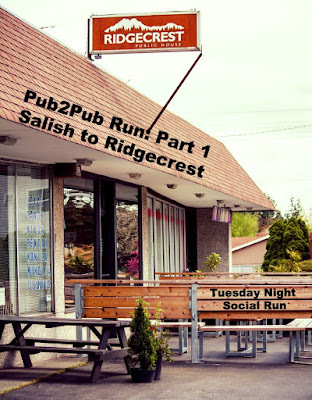 There are plenty of neighborhood routes near Ridgecrest if you're not up for the Pub2Pub mileage - please join the rest of the club after running either way. Thanks to fellow runner and Ridgecrest owner Megan for hosting us for this special summer run!